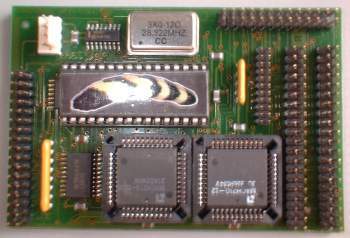 The catweasel Mk II is available in two versions, one designed to connect to the A1200's clock port and the other is a half length Zorro II card. This card allows the addition of up to 2 floppy drives and 6 IDE devices. It can use cheap PC floppy drives, both 3.5" and 5.25" in any combination as well as other formats. This card is basically a combination of the Catweasel and the Buddha IDE controller. You cannot however boot from the floppy drives. The controller also contains sophisticated algorithms to help read failing, sensitive or corrupted disks. Reading PC formatted disks is 2.15 times faster than using a native drive, and Amiga formatted disks are 1.3 times faster. The device also supports the use of floppy controller based tape drives, with a thru-put of up to 2MB/sec. It does not support DMA, but contains a local expansion port for adding additional expansions. Atari 800XL Atari 800XL formatted.